In today's drumming, the feet are just as important as the hands and Urban Boards may provide the ideal solution. There's an intimate connection with the pedal board and yet the shoe provides support while the thin rubber sole is enough for stress and shock protection. ...although you can't try before you buy, of course. Urban Boards shoes are made in Brazil, and sold directly online by Get Musical to reach you at a discounted price. The shoes are available in four colours - black, navy blue, red or Brazilian green and yellow - all with white logo flashes bearing the legend 'Drummer Shoes'. There's also a Dennis Chambers signature model, in black or red, which is £10 dearer and not reviewed here. The standard pairs lace up while the Chambers models have Velcro fasteners. "In today's drumming, the feet are just as important as the hands and Urban Boards may provide the ideal solution"
The design is of an exceptionally lightweight trainer with an extra thin sole. On scales they came in at 200g each shoe, while typical normal, thick-soled trainers were 340g. The Boards feel more like a pair of slippers than anything you'd wear outside the gym. The sole is a 3mm layer of natural rubber with a lightly stippled surface for grip; the uppers are a smart, streamlined design of suede and parachute silk. The heel is raised more than the average trainer, but only by 5mm. Inside the shoe there's a removable 'Smartech' antibacterial support lining that absorbs sweat and cuts down on nasty pongs. 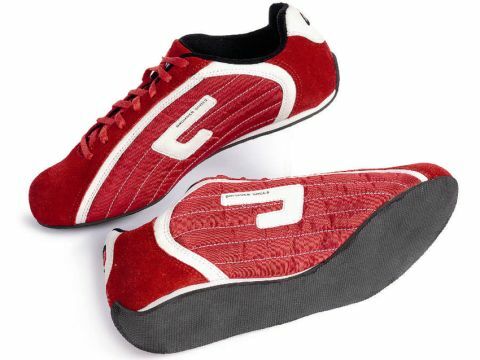 The shoes felt ideal for heel-toe rocking and side-to-side swivelling motions. Sliding up and down the length of the pedal, though, the minimal rubber grip is still enough to provide a fair bit of friction. Due to the super-lightweight construction and ventilation you can easily forget you have them on, even after several hours. They feel protective and supportive, but there's no sense of rubbing or chafing. In winter we can easily imagine turning up at a gig in heavy footwear and finding these ideal to slip into. Sizes range from 6 to 12 and the fit is snug - so much so that it's recommended you buy one size larger than your normal fit. This is a problem of buying untried - online means a massive saving, but there's the chance you may have to send them back.